Crooked Tree Arts Center presents the Harbor Springs Summer Friends Lecture Series in July and August, 4pm,in the charming and historic Harbor Springs Library. July 19 Scott Hocking was born in Redford Township, Michigan in 1975. He has lived and worked in Detroit proper since 1996. He creates site-specific sculptural installations and photography projects, often using found materials and abandoned locations. Inspired by anything from ancient mythologies to current events, his installations focus on transformation, ephemerality, chance, and discovering beauty through the cycles of nature. His artwork has been exhibited internationally, including the Detroit Institute of Arts, Cranbrook Art Museum, the Museum of Contemporary Art Detroit, the University of Michigan, the Smart Museum of Art, the School of the Art Institute Chicago, Contemporary Art Museum St. Louis, the Pennsylvania Academy of Fine Arts Museum, the Mattress Factory Art Museum, the Museum of Contemporary Art Chicago, the Kunst-Werke Institute, the Van Abbemuseum, and Kunsthalle Wien. He has received multiple awards, including a Kresge Fellowship and a Knight Foundation Challenge Grant, as well as residential grants in France, Iceland, Australia, Canada, Brazil, and throughout the United Scott Hocking_The_Celestial_Ship_of_the_North_Emergency_ArkStates. He is represented by Susanne Hilberry Gallery, Detroit. July 26 Anders Kelto is Public Radio International’s The World’s Africa Correspondent, based in Cape Town, South Africa. His primary focus is on health and development, and he also covers breaking news, politics, and culture. He has reported on everything from medical circumcision in rural South Africa, to media reforms in Zimbabwe, to discrimination against HIV-positive pregnant women in Kenya, to the disappearance of traditional names in Ethiopia. A Traverse City native, Anders was a three-time All-American and “Mr. Soccer” award winner in high school. He played college soccer at Brown University and Michigan State, where he was named All-Ivy League and All-Big Ten. He played for three seasons with the New England Revolution reserve team and coached for five seasons at Brown. Kelto is the co-founder and director of Mr. Soccer Camps in Traverse City. 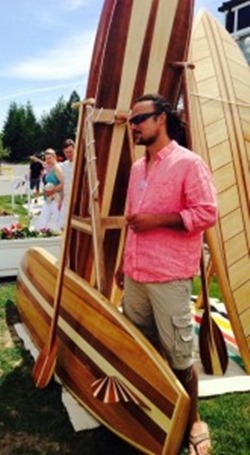 August 2 Ken Stolpmann Wooden boat builder by profession, New Zealand native, Ken Stolpmann creates functional works of art in his wood-framed bicycles called Owen Bikes. August 9 Marie Eckstein and Lin Alessio Red Dirt Road is a non-profit organization dedicated to empowering young women in Cambodia by providing them business and sewing skills to create, market and sell handmade designs.